In 1852 Charles Dickens said of solitary confinement, "I hold this slow and daily tampering with the mysteries of the brain, to be immeasurably worse than any torture of the body: and because its ghastly signs and tokens are not so palpable to the eye and sense of touch as scars upon the flesh; because its wounds are not upon the surface, and it extorts few cries that human ears can hear; therefore I the more denounce it, as a secret punishment which slumbering humanity is not roused up to stay." Closing in on two centuries later, Dickens might be surprised to find the specter of solitary confinement alive and well in the United States of America. He would be forgiven for wondering how a modern democracy, a "beacon of light" in a dark world, could permit a punishment that the Supreme Court referred to in 1890 as barbaric. 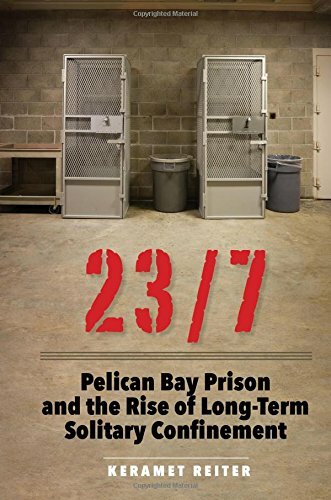 Compelling answers to this perplexing question can be found in Keramet Reiter's excellent new book, 23/7: Pelican Bay Prison and the Rise of Long-Term Solitary Confinement. Reiter, a professor at the University of California, Irvine School of Law, and nationally known expert on solitary confinement examines the history of solitary confinement in America and its nefarious journey from an unacceptable form of torture to an everyday aspect of modern corrections. Using California's Pelican Bay as her main vehicle, Reiter explores the rise of the supermax. Spurred by fears of gang violence and deadly riots, prison administrators sought and received funding and blessing to build concrete fortresses in which they would house "the worst of the worst." With little oversight, bureaucrats chose who would live in solitary confinement and for how long. The conditions endured by those in solitary confinement are known to cause and exacerbate mental illness. Lack of human contact, a diet that borders on starvation, and extreme idleness contribute to what has been called "SHU Syndrome." With the rise of the supermax came indeterminate terms of solitary confinement. Thousands of prisoners across the nation live in conditions deemed torturous centuries ago, for years and decades on end. Even the United Nations has denounced the practice. Reiter spends a considerable amount of text examining judicial oversight of supermaxes, and several landmark cases are discussed at length. While judicial decisions put a stop to the physical abuse of prisoners in solitary confinement ("Pelican Bay guards stopped freely scalding, caging, beating, and shooting prisoners"), they had an unintended consequence. Prison administrators took away from judicial decisions the minimum standards of humane treatment of prisoners, and established them as maximum "privileges" available to prisoners. In this way, a practice long considered torturous became a normalized part of modern corrections. The history of Pelican Bay and the rise of the supermax makes for an engrossing read. But what makes Reiter's book truly remarkable are the personal stories of the men who have been held in solitary confinement for years and decades. Who are these people, and why are they so dangerous? What has the experience of long-term isolation done to them? The answers to these questions are both surprising and saddening. One day the people of this country will look back at our national experiment with long-term solitary confinement in shame. That day will not come until we begin to acknowledge that the people we put in concrete boxes for decades on end are human beings first, felons second. Reiter's work is a first-rate examination of the rise of supermaxes. But the stories of the real people held in supermaxes makes this book an important contribution to the public discourse on how we punish and why.